Electricity is something we benefit from 24 hours a day, but give little thought how power companies like Entergy, maintain the lines. 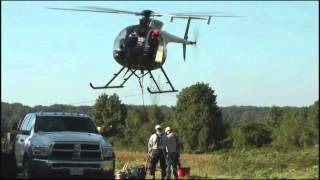 Entergy frequently uses helicopters to ferry linemen to the lines, or in this video change out old wooden cross arms to more reliable steel tubulars. Working in Mississippi on 115kV transmission lines crossing farm fields, using helicopters to upgrade the lines avoids the disruption of planted farm fields with bucket trucks. Using helicopters to ferry the linemen, tools and steel cross arms completes the job quickly, efficiently and safely.